If you are willing to sail near Athens, the Saronic Islands and the east coast of Peloponnese will satisfy your demands for a safe trip in calm waters. In close proximity to the Attica Prefecture (where Athens belongs) are some wonderful sailing routes that offer ideal sailing conditions, clean and calm waters, splendid coasts and different Islands to explore. The Saronic Islands of Aegina, Poros, Hydra and Spetses are the most popular sailing destinations. In the Argolic Gulf and along the east coast of Peloponnese you can make use of superb sailing and well-organized port facilities in the historical cities of Nafplion and Tolo, and marinas in Porto Heli, Astros and Leonidio. Sail across the deep blue of the Aegean Sea, amongst the island cluster of Cyclades, famous for its picturesque whitewashed houses, traditional character, cosmopolitan lifestyle, sun-kissed beaches, thousands of bays and creeks, and superb clear crystal waters. Sailing in Cyclades Greece is a wonderful and memorable experience! * the Northern Cyclades Islands: Kea, Kythnos, Andros, Syros, Tinos, Mykonos, Delos and Rinia. The beautiful Dodecanese Islands are located in Southeast Aegean. They are known for their excellent climate, clear sandy beaches, exquisite natural attractions and impressive historical and religious monuments. The Dodecanese Islands Cluster is comprised of Rodos (Rhodes), Kos, Kalymnos, Patmos, Leros, Astypalea, Kasos, Karpathos, Nissiros, Symi, Tilos and Kastelorizo, as well as a number of smaller islands. The Ionian Islands are considered as the most beautiful islands in the Mediterranean. They are located in the Ionian Sea, off the west coast of Greece, and they are composed of the beautiful islands of Corfu, Paxi and Antipaxi, Lefkada, Ithaki, Kefalonia, Zakynthos, Meganissi, Kalamos and Kythira. 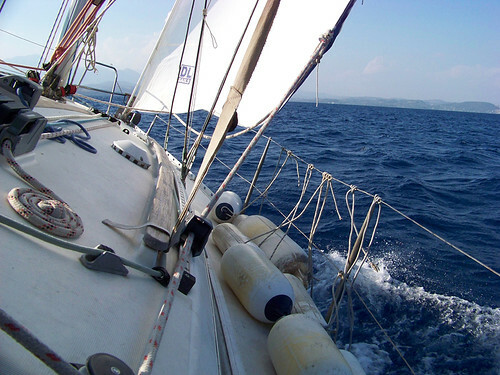 Go on a leisure cruise along the open Ionian Sea, and take enjoyable and relaxed sailing holidays! Corfu (Kerkyra), Paxos (Paxi) Lefkada (Lefkas), Ithaki (Ithaca), Kefalonia (Cephalonia), Zakynthos (Zante), Kythira (Kythera), Antipaxos (Antipaxi), Meganissi and Kalamos.